Japan has certified a man aged 93 as the only known survivor of Hiroshima and Nagasaki, both hit by atomic bombs towards the end of World War II. 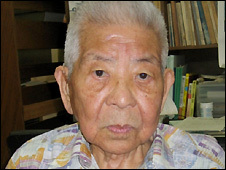 Tsutomu Yamaguchi was in Hiroshima on a business trip on 6 August 1945 when a US plane dropped the first atomic bomb. He suffered serious burns and spent a night there before returning to his home city of Nagasaki just before it was bombed on 9 August. He said he hoped his experience held a lesson of peace for future generations. Read that line again. "He said he hoped his experience held a lesson of peace for future generations." I'd say so. Lesson: if you value peace, keep this man away from your city.